of the years in which John Kennedy was active." Robert Francis Kennedy, 1925-1968. Attorney General of the United States; United States Senator from New York. 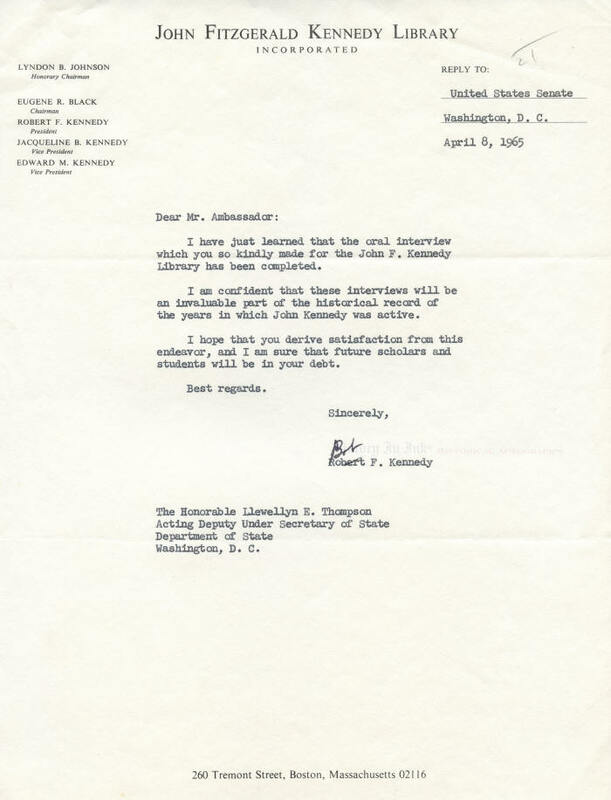 Typed Letter Signed, Bob, one page, 8½" x 11", on stationery of the John Fitzgerald Kennedy Library, Inc., Washington, D.C., April 8, 1965. Senator Kennedy expresses appreciation to Ambassador Llewellyn E. Thompson, who served under President Kennedy, completing an oral history interview. In full: “I have just learned that the oral interview which you so kindly made for the John F. Kennedy Library has been completed. / I am confident that these interviews will be an invaluable part of the historical record of the years in which John Kennedy was active. / I hope that you derive satisfaction from this endeavor, and I am sure that future scholars and students will be in your debt. / Best regards." Robert Kennedy, then still Attorney General, announced the taped oral history project on January 13, 1964. Initially, plans called for 150 people to record interviews, of whom Jacqueline Kennedy and Robert Kennedy were the first. Eventually the project grew to include some 300 people. Only one Secret Service agent declined to participate. The interviews were to be a part of the John F. Kennedy Library and Museum collection. President Kennedy himself considered locations for his presidential library on a trip to Boston a month before his assassination. He initially chose a location next to Harvard University, but after his death, the site was relocated to Columbia Point peninsula, in the Dorchester neighborhood of Boston, next to the University of Massachusetts Boston. The Kennedy family wanted a library that would also be a suitable memorial to the President. Out of a list of 14 potential architects, Jacqueline Kennedy chose I. M. Pei to design the building. By January 1965, contributions had doubled to $20 million the initial $10 million goal of Chairman Eugene F. Black. Delays in construction, however, increased the cost, and the library was not opened until 1979. President Jimmy Carter accepted the library on behalf of the American people at a ceremony on October 20, 1979. Llewellyn E. "Tommy" Thompson (1904-1972), a career American diplomat who served at a critical time in history, had served as the United States Ambassador to the Soviet Union under both President Kennedy and his predecessor, President Dwight D. Eisenhower, and was a key advisor to Kennedy and a member of his inner circle with respect to Soviet affairs. He joined the Foreign Service in 1928, and during his long and distinguished career he served as the United States Ambassador to Austria from 1955 to 1957 before Eisenhower appointed him Ambassador to the Soviet Union. He held that position under Eisenhower until Kennedy reappointed him in 1961. He resigned in 1962 to become Ambassador At Large, but President Lyndon B. Johnson reappointed him in 1967, and he served until 1969. He also held the post of Career Ambassador. He was part of the Executive Committee to the National Security Council, or ExComm, which advised Kennedy during the Cuban Missile Crisis in October 1962, and he was present at Johnson's summit with Soviet Premier Alexei Kosygin at Glassboro, New Jersey, in June 1967. He later came out of retirement to advise President Richard Nixon on the Strategic Arms Limitation Treaty (SALT) negotiations with the Soviet Union and to serve as a member of the United States delegation to the SALT talks from 1969 until his death in 1972. This letter is in fine to very fine condition.  It has two expected horizontal mailing folds and shows a bit of handling in the upper left corner, and Thompsonʼs pencil tick mark and initial "T" are in the blank upper right corner. Kennedy has signed with a black fountain pen. Provenance: This letter comes directly from the Thompson estate. It has never been offered on the autograph market before.